Copyright 2013, FX Networks. All rights reserved. American Horror Story has finished its third season with one of the most entertaining episodes in the past two years. But, honestly, the naming of Cordelia Foxx as Supreme was a twist we saw coming. There wasn’t much character development for her, or any of the people who survived to the final episode, to bring a sense of closure. There were so many dropped plot-points and extraneous characters, and something’s got to give. These past two seasons of American Horror Story have been sloppy and don’t shine a candle to Season 1. Here are some rules that American Horror Story would be wise to follow for its upcoming years on FX. 1. Keep It Simple. These past two seasons had so much going, a satisfying conclusion was nearly impossible. Coven focused on everyone but the coven – a sadistic slave owner, vengeance-obsessed voodoo priestess, crazy Christians, an axe murderer, witch-hunters, and zombies all stole focus from the witches and their storyline. It’s hard enough to put that in a cohesive sentence let alone a cohesive season. Asylum had a lot going on, too. There was a horror-movie style serial killer, Nazi doctor, mutant horde, demon possession, and aliens. It’s just sloppy storytelling to have a world with all those things existing in the same place. This isn’t The Avengers. Why not have a guest appearance by Falcor the flying dog? 2. Don’t Forget Character Development. Despite great lines and the highest caliber of actors to date, there were so many extraneous characters played by star names the series ignored core characters. The first episode and final episode featured the same characters, but we didn’t learn more about them over the course of the season. Still, Jessica Lange is such an amazing actor that she did so much with a pretty one-dimensional character: a snarky woman obsessed with immortality. 3. Less Stunt Casting. Part of the appeal of American Horror Story is the cast returns in new and interesting ways. With big names, there’s pressure to keep extraneous characters on the show longer. Then they have to conveniently leave before the season finale. Why did we know more about Delphine LaLaurie than the titular coven of witches? Her character didn’t further the plot at all. Patti LuPone’s character was resurrected for no logical reason. The Axeman?!? 4. Keep the Characters Together. The first two seasons kept all the characters in the same place, which allowed for more story and character development. So much action took place outside of Miss Robichaux’s Academy that the coven lost focus. There was no reason why the school couldn’t have been Delphine’s old estate with her buried in the backyard. Why couldn’t Angela Bassett and Patti LuPone play members of the Witches Council? These detours robbed us from getting to know some amazing characters like Misty Day, Myrtle Snow, and Zoe Benson. 5. Don’t Drop the Ball on Important Plot Points. The writers come up with really great ideas then throw them away in favor of plotholes. Zoe had an interesting power with her killer vag, she defeated super-witch Marie Laveau’s magic, and reanimated a ghost. Why wasn’t she the Supreme or the Antichrist or something more interesting than Kyle’s girlfriend? 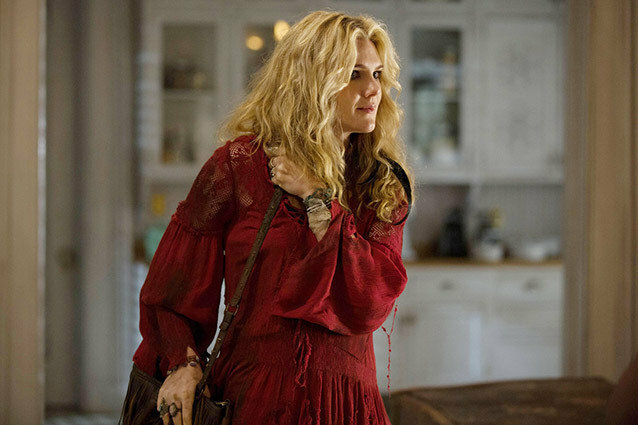 How could Queenie ressurect Misty Day but not Zoe? Queenie left to go study voodoo with Marie but didn’t come back with any new power. These are all missed opportunities. 6. Know How It’s Going to End. It’s nice when a show includes clues for the discerning watcher. However, some shows Lost have made it a valid choice for writers to not know how things will end. The first episode introduces Zoe in Coven and aliens in Asylum but nothing happens at all. It also seems the writers didn’t know who the Supreme was going to be. All signs pointed to Zoe or Madison. Conveniently, having Madison’s death make Cordelia the Supreme is an interesting mystery to leave unsolved. But it seems more a result of sloppy storytelling than intention. If Cordelia was set to be the Supreme all along at least make her a more vital part of the series. There was never a scene of an actual class at this school. 7. Give Characters the Exit/Death they Deserve. In Asylum, Sister Mary Eunice becomes possessed by the Devil and becomes the most interesting character on the show. She had a Sam/Diane attraction to Nazi Dr. Arthur Arden. They both were major antagonists but died in anticlimactic ways with no resolution to their storylines. 8. No More Racism. The Nazi storyline didn’t come to a crescendo last season, so what was the purpose of going to Anti-Semitism? This season’s irresponsible treatment of its black characters was also an epic fail. It’s completely implausible for an immortal super witch, who charges 10,000 a spell, to spend her free time doing hair at a ratchet beauty salon. It didn’t come off as ironically humorous as much as flat out racist. The season-long slavery arc was also a bit much. 9. Don’t Shock to Shock. The multiple molesting moms this season were gratuitous because they didn’t further the story or their sons’ characters. If you’re going to go there at least make a point. 10. More Lily Rabe! She’s the best part of the past two seasons. ‘Nuff said.